What was I doing at 8.30 am this morning? Sitting in my bed, propped up by pillows with tears dripping off my chin. I had just finished reading The Book Thief. Before I write any further about this book, a bit of background to explain why I was reluctant to read it. Back in 1970-71 there was a mini-series called The Holocaust (yes, I know the words mini-series and Holocaust should not appear in the same sentence, but this was in the days before political correctness)which was aired on US and UK television. This was the first time this subject matter had been dramatised in an 'accessible' format. It was, of course, somewhat sanitised compared with how it would be done today, and I can remember none of the actors save for a young Meryl Streep. It had 5 episodes spread over one week and I watched them all. By the end of it, I was totally traumatised and for months afterward could not get it out of my mind. I was appalled by man's inhumanity to man and it affected me deeply. In the early 1980's I went to the cinema to see Sophie's Choice, a film set in World War II and, oddly enough, starring Meryl Streep later on in her career. For those of you who have read this book or seen this film, you will know what Sophie's choice turned out to be. By then, I was a mother and was so upset by the time her 'choice' had to be made, that I left the cinema. We are now in the 1990's and try as I might, and I have tried, I cannot, but cannot watch Schindler's List. I decided to watch it in the quiet of my home, not at the cinema, and each time it is on, I have found excuses to leave the room, make a cup of tea, anything just to get away from what was unfolding on the screen. To this day, I have not seen it. Then three years ago I was attending a conference in Amsterdam and visited Anne Frank's house. I am sure no further comment is needed from me. While I was there a large party of giggling, misbehaving teenagers arrived and the adults, including me, winced at their noise and disrespect. No need, within 30 seconds this gaggle was silenced and they went round the house in disbelief and close to tears. This preamble, long and tedious though it is, will explain why I came to this book with such reluctance. I have read conflicting reviews, as is always the case with a book that has been on the receiving end of hype and publicity. One reviewer says 'Marcus Zusan has not written Harry Potter and the Holocaust, it just feels like it'. Another says it is fanciful. Another self congratulatory and some take issue with the whimsicality of having Death as the narrator. Liesel Meminger is a young girl who loses her brother at the very start of the story, her mother disappears and she is put into foster care with Rosa and Hans Huber . Liesel steals books. She steals because she has lost everything, it is her way of getting back, of retaining a hold on sanity. The first book she steals is a Guide to Grave Digging which she finds at the graveyard where her brother is buried. Later she saves a book from a bonfire lit to celebrate the Fuhrer's birthday, she also steals books from the Mayor's wife, a sad, forlorn woman mourning the death of her son and who later becomes complicit in her thefts. The Hubermans hide a Jewish refugee in their basement, Max Vandenburg. He has a copy of Mein Kampf which he turns into a blank book by painting the pages with white paint and writes a story of his own for Liesel. 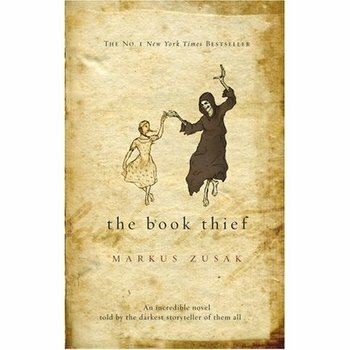 He is hidden by them for two years but when it gets too dangerous he leaves to an uncertain fate in order to save them by which time he and Liesel have forged an everlasting bond through their love of words. All this is narrated by Death and yes, sometimes it is whimsical, sometimes it is almost a bit too precious to be good writing, but this is balanced out by Death's mordant wit 'By the way, I like this human idea of the grim reaper. I like the scythe. It amuses me'. So, while I can understand some of the critical comments in the reviews, I don't care. This is a case of the total being more than the sum of its parts. The ending is heart wrenching and even Death feels sorrow 'I am haunted by humans' . Then, there is joy, a happiness of sorts in the final few pages. I cannot remember last reading a book that moved me so much and it will stay with me for a long time.